Angola will hope the legacy of this African Cup can still be one of prosperity and positivity. 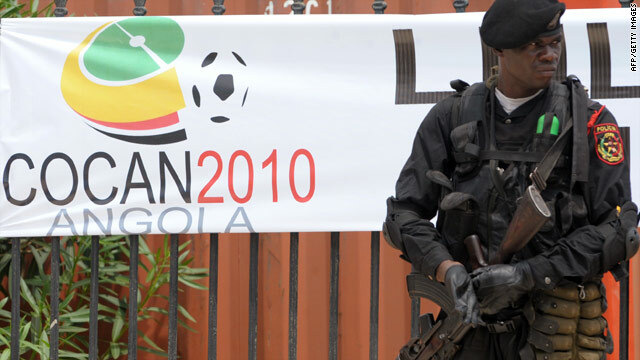 Attack on Togo team at Nations Cup focuses attention on Angola's bloody past. Country only ended its 27 year civil war in 2002. Angolan economy booming, but three quarters of the population live on less than $2 a day. London, England (CNN) -- It was supposed to be Angola's time in the sun, the moment when a warn-torn nation finally emerged from the wreckage of three decades of civil war and took its place front and center on the continental stage. More than $1billion of the country's vast oil wealth, according to the government, had been invested in stadiums, roads, hotels and hospitals ahead of the Africa Cup of Nations (ACN), world football's third largest tournament, in anticipation of what the former Portuguese colony hoped would signal its victorious coming of age. "It is an opportunity to showcase Angola to rest of the world and also enhance development," Antonio Mangueira, executive director of the tournament's local organizing committee, said in an interview with the Confederation of African Football (CAF) last month. "We are also sending across the message to all that Angola is a nice country, the war is over and we are united." But as the tournament kicked off in the capital Luanda, with a thrilling 4-4 draw between the hosts and Mali, unity and international redemption was the last thing on anyone's minds. Last Friday's deadly machine gun attack on the Togo national team bus as it travelled to the troubled, oil-rich Angolan exclave of Cabinda, leaving three of the party dead and the team's reserve goalkeeper in intensive care, has thrown into doubt the southern African state's readiness to host such a high-profile event. On the face of it, awarding Angola the Nations Cup in 2006, just four years after the end of the war and in the same year a peace deal was signed between the Angolan government and the Front for the Liberation of the Enclave [sic] of Cabinda (FLEC), who claimed responsibility for the attack, was a controversial move. But CAF has a history of using the African Cup of Nations as a developmental tool, allowing poor countries to invest in much needed infrastructure to boost tourism and business long after the ACN circus had left town. "The African Cup of Nations does do a lot for its host country," said journalist Ian Hawkey, an African football expert and author of "Feet of the Chameleon: The Story of African Football." "In the last 15 years both Mali and Burkina Faso have hosted it, and now Angola. You would have said at one point, no way can these places organise a tournament. But they got stadiums out of it and Mali's football has grown since 2002, Burkina Faso's too." Angola, though, was always going to be a tougher sell. For 27 years Angola was gripped by a vicious civil war that followed Portugal's decision to cede power in the wake of its 1974 socialist revolution. In the vacuum, the pro-U.S. National Union for the Total Independence of Angola (UNITA) and the Marxist Popular Movement for the Liberation of Angola (MPLA), backed by the Soviet Union and Cuba, fought a proxy Cold War for control of the country and its vast oil and diamond resources. Up to half a million people perished in the conflict which, according to the UN, also left 15,000 landmines behind. The war didn't officially end until 2002 when a peace deal was signed after the death of UNITA leader Jonas Savimbi. The MPLA's president Jose Eduardo dos Santos, has been in power since 1979. "Angola is an interesting case of an 'illiberal war to peace transition'," explained professor Christopher Cramer from London's School of Oriental and African Studies and author of "Civil War is Not a Stupid Thing: Accounting for Violence in Developing Countries." "It has been politically pretty stable at the macro level since the end of the war but it has not been through quite the same kind of economic and political reforms that many countries emerging from violent conflict find themselves pressured to pursue: democratization and rapid market liberalization." As a result, Angola has developed unevenly, despite annual oil revenues of $6 billion and a GDP which, according to the IMF, rose by 16 percent in 2008. "It remains a phenomenally unequal country and one that is not politically very open," Cramer told CNN. "But there has been quite rapid economic growth and ... something of a boom in the capital." That economic boom lead to Luanda being named the most expensive city in the world to live in, according to an annual survey by ECA International. Yet few outside the tiny local elite see any of this wealth, with three quarters of the country's population living on less that $2 a day. According to the 2009 UN Development Program's Human Development Index, a benchmark for a country's development, Angola sat 143rd out of 182 countries. Corruption further deepens the problem, with Angola ranked 162nd out of 180 countries on Transparency International's 2009 Corruption Perceptions Index. Nowhere is this disparity more keenly felt than in Cabinda itself, one of Angola's poorest regions, which according to Hawkey, "is a tiny exclave that only exists because of oil." Separated by a strip of the Democratic Republic of Congo, Cabinda's massive offshore oil fields provide half of Angola's oil wealth. It was a separate province under Portuguese rule but incorporated into Angola on independence in 1975. Separatists have fought for their own independence since 1963, although there were few signs that such an atrocity would take place given that FLEC had signed a peace deal with the government in 2006, and a former FLEC rebel, Antonio Bento Bembe, is now a minister in Angola's government. For Bembe, who initially denied that FLEC even existed anymore, hosting the games in Cabinda was a chance to bring visitors and much needed money to the area as well as fostering national unity. "It wasn't absurd to have it [Cabinda] as a host city," agreed Cramer. "It could even have been construed as a nation-building initiative." That aim may now seem harder than ever. But Angolans will hope that the legacy of this African Cup of Nations can still be one of prosperity and positivity, as was the case in Mali and Burkina Faso, rather than body bags and bullets.